You know what my kid loves? Dressing up. Toddlers love playing dress up - definitely not a new concept. Emma is no exception. 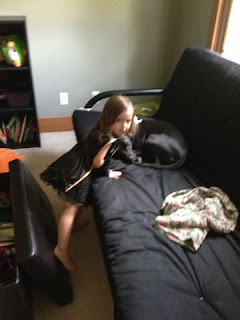 She has a bin full of princess numbers and feather boas and even a few capes and masks. I absolutely love seeing her play so creatively and she seems to thrive when she can pretend to be a princess or a police officer or a doctor or a super hero or a mix of all of the above. 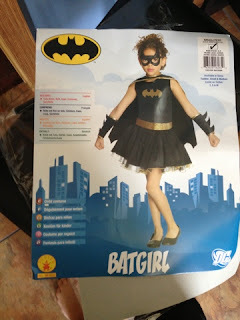 It's so completely right up her alley right now, as she's caught between a wistful land of all things girly and all things SUPER (with a special emphasis on Batman). 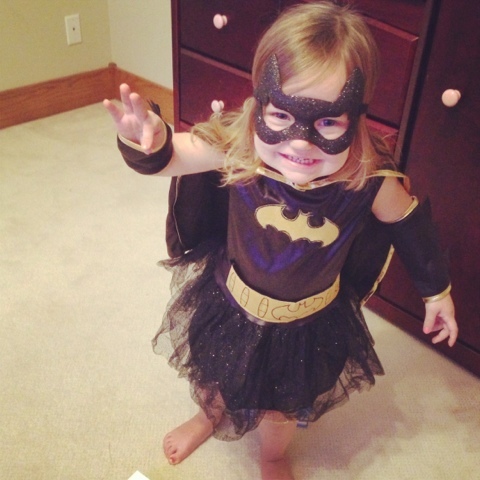 I put the entire outfit on her and she immediately started referring to herself as Ballerina Batman. Okay, sure. I see it. And she could too. It took me about a half hour to get her away from the full length mirror, where she proceeded to kiss herself, spin around in circles and announce that she could fly high! in the sky!! 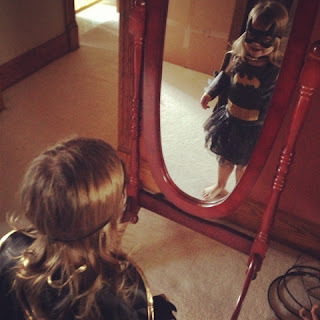 (I didn't have the heart to tell her that Batman doesn't fly. She's two. A kid can dream). The costume itself is better than average quality. While it's still a typical costume - it's not exactly made of the finest silk and satin, the bodice is soft to the touch and the arm bands are thick and sturdy. The printing on both the belt and the bodice of the dress is durable and the tutu of the dress is several layers thick - perfect for a little modesty for a tot (which I was definitely worried about). I only noticed one real problem. The mask, while adjustable, dug in horribly to the kid's face. 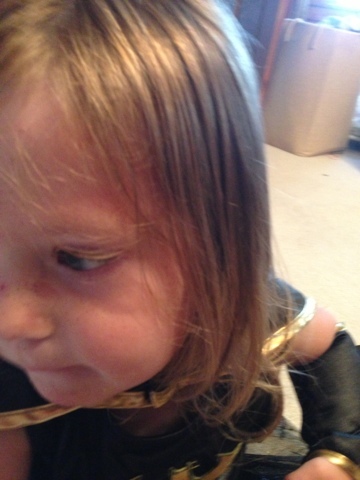 I loosened it as much as possible and then just took it off, only to find her eyes covered in little specs of glitter... prompting both a meltdown because I removed a precious part of her "Super Ballerina Batman" costume but also because the glitter flecks were getting into her eyes and irritating her. It might be hard to see, but there are rub-welts on the bridge of her nose and on her forehead, and glitter a-plenty covering her round little face. Lesson learned - I immediately threw the mask into the Goodwill pile when she wasn't looking and encouraged her to go save the day. With Super Ballerina Batman on the scene, the dog can rest easy until another day. Check out Halloween Adventure on Facebook and Google+, and be sure to check out their awesome selection and competitive prices online before Halloween sneaks up on you! Or, ya know, be like Emma and make every day a dress up day. I was provided the costume free of charge for review, but the opinions and images are all mine.